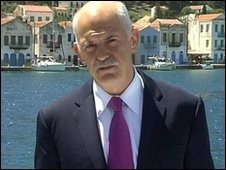 Greek Prime Minister George Papandreou said the nation’s survival was at stake in talks to win a potential $159 billion European Union-led bailout that included budget cuts denounced by unions as “savage.” “Now, today, immediately, what is at stake is the survival of the nation,” Papandreou said in parliament in Athens today. “This is the ‘red line.’” He said talks with the EU and International Monetary Fund were “tough,” with his government resisting “not in the street with rocks, but in negotiations.” Greek stocks rose and the euro strengthened as an EU spokesman said an agreement on a three-year package may come as soon as tomorrow. Signs of the accord that may require 24 billion euros ($32 billion) in austerity measures ended a bond market selloff across Europe this week. Moody’s Investors Service said yesterday Greece was vulnerable to a “multi- notch” downgrade if measures don’t go far enough. Greece’s fiscal crisis rippled through Europe this week, sending the euro to its lowest in a year after Germany’s reluctance to approve emergency funds sparked a drop in Greek bonds and Standard & Poor’s cut the country’s credit rating to below investment grade. S&P followed its Greek downgrade with cuts for Portugal and Spain. Papandreou’s budget cuts may include a three-year wage freeze for public workers and eliminating two of their 14 annual salary payments, the ADEDY union said. Greece’s NET Radio reported that cuts could amount to 10 percentage points of gross domestic product. The deficit was 13.6 percent of GDP in 2009. Greek regulators have announced a ban on short-selling on Greece’s stock market, following steep falls in bank shares. The ban is designed to prevent investors betting on falls in share prices – believed to undermine confidence in the market. On Tuesday, Greek bank shares fell 9% amid continued concern over Greece’s public finances. The move also follows big falls in Asian markets on Wednesday. 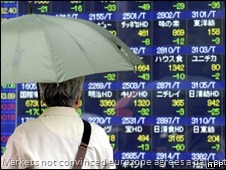 Japan’s leading share index, the Nikkei 225, closed down more than 2.5% after steep falls in European stocks on Tuesday. Shortly after opening on Wednesday, stock markets in Frankfurt and Paris were both down by a further 0.5%. The short-selling ban, designed to stabilise the market, only affects stocks listed in Greece, however. Global shares have tumbled after the credit rating agency Standard and Poor’s downgraded Greek debt to "junk" on Tuesday. That means the rating agency views Greece as a much riskier place to invest, and increases the interest rate investors will charge the Greek government for loans. On Wednesday, that interest rate hit 10.13% for 10-year Greek bonds – another all-time high for a eurozone country. Meanwhile plans to secure a bail-out for the Greek economy will continue later, with the International Monetary Fund (IMF) arriving in Berlin to urge German MPs to agree to a rescue deal. Dominique Strauss-Kahn will travel to Germany along with the president of the European Central Bank, Jean-Claude Trichet, to persuade politicians that giving Greece billions of euros in aid is a "last resort". Progress on a deal to bail out Greece may also help to steady investors’ nerves. During a visit to Tokyo on Wednesday, European Council President Herman Van Rompuy announced a meeting of eurozone heads of state and government would be held on 10 May to discuss the Greek crisis. He insisted negotiations on the aid were "well on track" and that there was "no question about restructuring" Greek debt. Uncertainty over an aid package for Greece pushed up its borrowing costs to a 12-year high on Monday, with demands from Germany for further austerity measures before aid is granted heightening the tension. Greece tried to reassure investors on Sunday that aid would arrive in time to avert the euro zone’s first sovereign debt default, despite signs that a 45 billion-euro ($60.49 billion) EU-International Monetary Fund package would have to be bigger. But the premium investors demand to buy Greek government bonds rather than euro zone benchmark Bunds hit a new 12-year high on Monday because of concern over the implementation of the aid package and the conditions attached. "The market wants to see the cash laying on the table, not in a coffer besides the table," said David Schnautz, strategist at Commerzbank in Frankfurt. The backing of Germany, Europe’s biggest economy, is vital for any aid but Berlin faces public opposition to a financial rescue and is taking a tough line over the terms. "The government has not taken a decision (on aid)," German Foreign Minister Guido Westerwelle told reporters at a meeting of European Union ministers in Luxembourg. "That means that the decision can fall in either direction. Offering money too soon would get in the way of Greece doing its homework with the requisite diligence and discipline." Despite German pressure on Athens, markets kept pressure on Berlin to decide fast by pushing up the cost of insuring Portuguese government debt against default to a record high because of fears that Portugal could be next to debt crisis. Greek Prime Minister George Papandreou has asked for activation of an EU-IMF debt rescue mechanism, to help pull the economy out of its current crisis. It follows negotiations with eurozone nations and International Monetary Fund over the details of an emergency rescue package. It comes a day after data showed a worse-than-expected budget deficit of 13.6% of gross domestic product. Credit rating agency Moody’s also cut its rating on Greek debt on Thursday. The BBC economics editor Stephanie Flanders said that during the Greek crisis eurozone finance ministers had been hoping that the promise of support would be enough to reassure investors. But that had not been the case, and our correspondent said the pressure was now on to come up with the fine detail of a deal very quickly. She said that, with very tight economic conditions already in place in Greece, any IMF conditions attached to loans would likely be of an economic nature, such as interest rates, rather than calls for more stringent cost-cutting measures. "Even if Greece, with this money does get through [the crisis], it is still going to hurt for sure," she added. Greece’s budget gap last year was worse than feared, the European Union’s statistics office revealed on Thursday, as Moody’s Investors Service downgraded its rating of Greek government debt. The news triggered a fresh slide of asset prices in Greece and other debt-choked European countries, and increased pressure on Athens to seek billions of euros of emergency loans from the EU and the International Monetary Fund. Greece will need to refinance 8.5 billion euros of bonds maturing on May 19, and as soaring yields make it ruinously costly for Athens to issue bonds, investors think it may need a bailout to avoid defaulting or restructuring its debt. "It looks like a terrible situation just got worse," said Nick Kounis, economist at Fortis. The budget figures were announced as tens of thousands of Greek nurses, teachers and other public workers staged a one-day strike to protest against the government’s austerity measures. They demanded that Athens reject any pressure for further spending cuts in crisis talks that it launched this week with the EU and the IMF. The Greek government posted a budget deficit of 32.34 billion euros or 13.6 percent of gross domestic product in 2009, not the 12.7 percent which it had reported earlier, Eurostat said in a review of countries’ deficits throughout the region. It added that the Greek deficit might be revised again, by between 0.3 and 0.5 percentage points of GDP, because of uncertainty about the quality of Greece’s data and accounting procedures. In a brief statement, the Greek Finance Ministry insisted the new numbers would not change its intention to shrink the deficit by four percentage points this year. It said measures already taken would be enough to cut the deficit by six points. But both Athens and EU officials appeared to be backing away from a previously announced target for Greece to slash the deficit to 8.7 percent of GDP this year. "The target for 2010 is a four percentage point reduction of the deficit. We did not refer to the starting point or the arrival figure, only the reduction effort,"
The Greek government’s cost of borrowing has hit a new high as talks on a joint eurozone and International Monetary Fund (IMF) rescue plan begin. The interest rate on 10-year government bonds hit 8.3% – the highest since the euro was introduced. Rates rose as it became clear that talks over the aid package may not be finished until days before a multi-billion-euro loan is due for repayment. Investors are becoming more convinced that Greece will need to be rescued. Greece’s finance ministry said the talks with the European Commission and the IMF would take about two weeks, with a joint text issued on about 15 May. On 19 May, Greece is due to repay investors an 8.5bn euros (£7.3bn) bond. The talks cover austerity measures that Greece must take during the next three years to reduce its 300bn-euro debt mountain. If all sides can agree the measures, it should help clear the way for a quick payout of up to 40bn euros on offer from eurozone members and the IMF. In a statement on Tuesday, Greece’s finance ministry said: "The discussions concern a three-year programme of economic policies… which can be supported with financial assistance from eurozone members and the International Monetary Fund should Greek authorities decide to request the activation of the mechanism." Greek Prime Minister George Papandreou has said his country is making "preparatory moves" to take advantage of a multi-billion euro rescue package. He added, however, that Greece would not necessarily make a formal request for help. On Sunday, the eurozone and International Monetary Fund (IMF) agreed details of a loan package to help debt-ridden Greece. Concerns about Greece’s high levels of debt have put pressure on the euro. The currency fell by 1 cent against the dollar on Thursday, and slipped a further 0.54% on Friday to close at $1.3506. On Tuesday, Greece successfully raised 1.56bn euros ($2.1bn; £1.4bn) in an over-subscribed issue of bonds, designed to raise money to repay some of its debt. However, the country’s finance ministry said on Thursday that it had written to the European Union, European Central Bank and IMF to discuss the rescue plan. The IMF’s managing director, Dominique Strauss-Kahn, responded to the letter, saying he would send a team to Athens on Monday to begin negotiations.